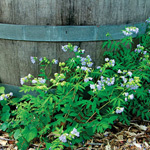 A reliable spring wildflower for shade. Mounds of foliage last until Sept. & Oct. with adequate moisture. 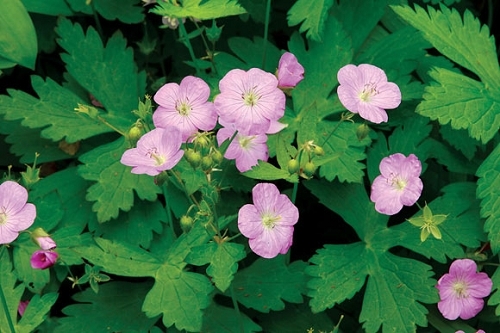 Seed: Harvest in May as soon as some of the seeds start exploding--wild geraniums disperse their seed mechanically by catapulting the seeds a considerable distance. Keep the seed pods or "crane's bills" in a paper sack until all of the seeds have been released and sow immediately. Seedlings should emerge the following March or April. Q: I recently purchased a pot and have noticed a progressive yellowing/browning of leaf tips and leaves . . . the plant is in the nursery pot. I have misted/watered twice each day (morning, then evening - about 12 hours between watering). What can I do to reverse the issue I'm seeing? A: Your watering regimen is more frequent than necessary, but that likely isn't the problem. Wild geraniums go dormant this time of year, and their fall foliage isn't the most attractive. There really isn't anything you can do to prevent this. Go ahead and get it in the ground. It will pop back up next spring with new, lush foliage.